There are many ways to shave seconds off Windows 7 startup times. Some methods are easy, safe, and quick. Others require fairly advanced knowledge of Windows and a bit of trial and error. If you don’t know what you’re doing, you can waste more time than you will save over thousands of startups. Here are some of the faster fixes you can implement without getting too many electrons under your fingernails. Begin with your computer’s BIOS setup utility. You can access it when your computer starts up by pressing a function key before Windows loads; typically, the F2 key is the one to press, but your BIOS may vary. A message will briefly appear on the screen during startup, indicating which key you should press to access the BIOS setup menu. Once in the BIOS utility, select the “BOOT” menu item. On the resulting screen, look for an option labeled “quick boot,” “quiet boot,” or similar. Enabling this option skips several system tests that are generally unnecessary, making startup faster. You can disable this option later if necessary. Some BIOS versions may not offer this option. Also check the Boot Device Priority screen. The first device from which the BIOS tries to boot should be your Windows disk drive, typically your primary hard drive. Time is wasted during startup if the BIOS tries the CD/DVD drive first, then a USB drive, etc. Note that you will not be able to boot from removable media (such as a CD) if a hard drive is the first priority boot device. You’ll probably not need to boot your computer from a CD or DVD unless you’re doing something geeky like installing or upgrading an operating system. But if you do need to do so, you have two options. The first is to go back into the boot priority screen and change the setting so the BIOS will look first at the CD/DVD drive. A second option available on some computers allows you to access a “one-time boot selection menu” during startup. On my Gateway computer, that option is activated by pressing F10. Other computers may use F11 or F12. Just watch the messages during startup and you’ll see which key to press. I had a friend in college who was fond of the "Five P's" mantra. His advice applied to life in general, but it's true that regular computer maintenance keeps startup speeds down and helps your system run faster overall. 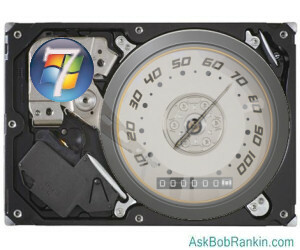 Defragment your hard drive, clean up junk files, scan and fix bad disk sectors on a regular schedule. See my related articles listed below for advice and tips on how to maintain your hard drive. How Often Should I Defrag? Programs that load while Windows is starting up are a big cause of slow startup times. Some of these startup programs are necessary, but many are not. You can turn off certain startup programs or delay their loading until after Windows is fully started. The msconfig utility built into Windows lets you manage startup programs, among other things. Start it by opening the Start menu and entering “msconfig” into the Search box. Click the utility’s “Startup” tab to view all of the programs that are loaded during startup. Uncheck any programs that you don’t need to have loaded during startup. This is where saving startup seconds can become a waste of time; if you don’t know exactly what all startup programs do, you can spend hours researching them. If you disable the wrong startup program, you may create a new problem. A program called Startup Delayer doesn’t disable loading of startup programs, but delays their loading until some user-specified times after Windows loads. The idea is that you can start working faster and let these programs load later, one by one, with minimal impact on system performance. An option in the Startup Delayer helps you learn more about each startup program, so you can decide whether or not to delay loading. If you notice a extended period of "thrashing" by your hard drive during startup, this utility should help. You can also disable unnecessary Windows services that load during startup by default, or set them to “automatic” so that they are loaded only when needed. See my more detailed article, Speed Up Windows 7 for tips on which services can be safely disabled in most cases. You might also be interested in reading Do Those Speedup Your PC Programs Really Work? If Windows 7 starts in less than 60 seconds, my advice is to avoid tinkering with startup programs and services unless you’re certain you know what you’re doing. The average user will spend more time researching which items can be safely disabled or delayed than he/she will save during startups over the next ten years. In the worst case, tinkering can leave you with a system that won’t start at all. Most recent comments on "Speed Up Your Startup"
I find that the free Soluto (https://www.soluto.com/) can be very helpful in reducing startup time. I used to turn off my old XP desktop every evening. This meant scheduling my day around the morning reboot. I push the Sleep button on the keyboard of my Windows 7 machine. I turn off USB disks, speakers, and modems, but it takes only a few coffee-sip times to get going in the morning. Most times I put my laptop in "sleep" mode instead of shutting it down. It only takes 5 seconds to sleep and less to wake up. Windows 7 is very good at handling internet connections, network drives and default printers as I move between office and home. I have been told that defrag is not necessary with Windows7. Is that correct? EDITOR"S NOTE: Correct, do not defrag an SSD. Useful article. I generally avoid the full startup rigmarole by hibernating the PC. It uses no power in hibernation, unlike standby/sleep, where the RAM remains live and powered-up. It's much faster to resume from hibernation than booting up from cold and it also means that whatever you were in the middle of doing is still there on the screen when you resume. Windows 7 (Control Panel | Power Options) allows you to specify what events are triggered by closing the lid, pressing the power button, etc. It's easy to make the power button or lid closure put the PC into hibernation. The only time I reboot is after installing Windows updates or when there has been a problem of some sort. any of the programs with a mouse click. WinPatrol[Free Edition] takes care of a number of steps you recommend to speed up your PC. You can disable a program on your Startup list without opening msconfig and without having to reboot. You can easily move a program to the Delayed Start list. You can check what ActiveX controls are installed, as well as Active Tasks, Scheduled Tasks, IE helpers and Services running on your computer. And one of its best features is to warn you anytime a program wants to put itself in your Startup list. You can download the latest version here: http://www.filehippo.com/search?q=winpatrol. Although currently still relatively expensive, a solid state drive should be a lot quicker to boot from than waiting for a hard drive's platters to spin up - (or even just using a faster hard drive as boot drive should reduce start-up times). I've just ordered a new 240 GB Intel 520 series ATA 6 Gb/s Solid State Drive with exactly that intention. (But, while defraging will speed up normal hard drives, apparently trying to defrag these Solid State Drives is NOT a good idea). Try CC Cleaner. after you open on the left side is a button called tools click it then click start up and it will show you what programs start up when you start your system. Disable all that you do not want to start up. It really improved my start up time. I have found a terrific solution for a faster startup: I simply leave my computer on all the time! Since I use the computer on and off at all hours of the day and night except of course when I'm sleeping, why shut it down for just eight hours? I simply turn off the monitor when I go to bed. I can't imagine I'm wasting very much energy. Of course if I go away for a few days, I turn it off. Setting Windows services to "automatic" means they will start when Windows starts. To have services start only when needed they must be set to "manual." Do some careful research before messing around with Windows services. Of all the advice you offer, I think the last paragraph of this article is the best advice for ALL. "If Windows 7 starts in less than 60 seconds, my advice is to avoid tinkering with startup programs and services unless you’re certain you know what you’re doing. The average user will spend more time researching which items can be safely disabled or delayed than he/she will save during startups over the next ten years. In the worst case, tinkering can leave you with a system that won’t start at all." How true is that!! I am certainly not anywhere near as proficient a user as I would like to be but that advice should apply to nearly all your comments. Another decent (not perfect) program is 'Soluto'. You can disable, delay or ignore most startup programs based on their recommendations and also view what other users did. What amazed me was that it even had an option for it's own program. I think impatience is one of the greatest drawbacks of the computer era because when I hear people complaining about a few seconds waiting for startup - I just want to reach out and slap somebody. My Vista basic used to be quite quick at starting up, but now it takes 5 minutes ! I may have loaded up this very basic computer that has only 2 Go and 1.6 GHz AMD processor single core. Amazingly before I added too many programs this little wonder of a small computer was quite fast, I could watch live TV on it with barely any lag ! Windows 7 on this machine was rather sluggish. Nothing else I tried works. CC or the advice posted here. got this tip from windows tips and tricks...in windows 7, (and i think vista too),windows startup defaults to one core, no matter how many cores the machine actually has...open msconfig,boot options,click advanced tab, and in the upper left corner of the box you should see number of cores, it should show 1...click,and a drop down menu should show the actual number of cores,selct, click apply and exit...every lil trick helps, and its not a iffy change...hope this helps! 1. I prefer to leave the Start from CD/DVD as the first option in case of "emergencies" of various kinds, then you don't have to mess about. 2. I agree with previous comments, that Soluto is very good: although it does take a few seconds itself, the time it has saved me well outweighs that (things like Adobe constantly putting itself in start-up whenever you update it). They also monitor programs which crash, and one can automatically send them details of these - though they so far seem to have done nothing with this data. But it does tell you how often a program has crashed recently, which may tell you that you need to update it, modify it, etc. 3. One real plus is that they tell you what programs you can safely leave out or defer the start-up of until after boot - though too many times they have no details on well-established programs; it does stop you deleting essential Windows stuff - but you often need to use your own judgement on other things that they describe as essential. 4. Most programs, including Windows, do not tell you everything that starts at Boot - Soluto is pretty comprehensive. Buy and install an SSD drive. That cut my boot time about in half. Use a properly written defragging program, unlike the Windows version. Defrag the registry and hive using various utilities that are around. Run Microsofts boot profiler utility to re-arrange and optimise startup services. Delete Win 7 and go back to running Windows NT 4. It would most likely boot up in under 10 seconds if running on todays hardware!